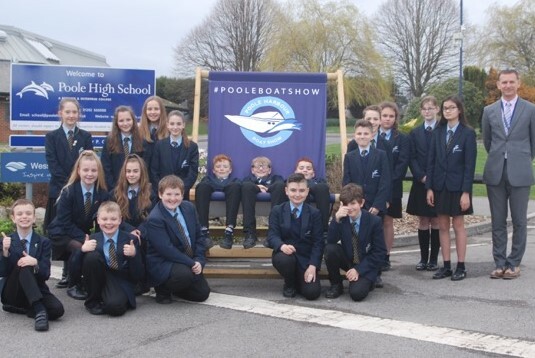 Poole High School has joined forces with the Poole Harbour Boat Show (PHBS) with the school community planning to get involved and make a positive contribution to the popular boat show. The fifth annual Poole Harbour Boat Show, in association with Sunseeker, runs from 7th – 9th June. With over 32,000 people in attendance in 2018 the Show, organised by Poole Harbour Commissioners (PHC), continues to be the biggest-ever, FREE to attend Boat Show on the South Coast. The Poole Harbour Boat Show is being supported by Sunseeker, Sibbett Gregory, Coleman Marine Insurance, Conker Spirit, Elite Signs, Greenslade Pleasure Boats, PKF Francis Clark, Lester Aldridge, British Marine Wessex, MS Amlin, WQI Marine, Brittany Ferries, Rockley Watersports and media partners Bournemouth Daily Echo and Wave 105. The show will open daily from 10am – 6pm, Friday 7th – Sunday 9th June. For further details visit: pooleharbourboatshow.co.uk.